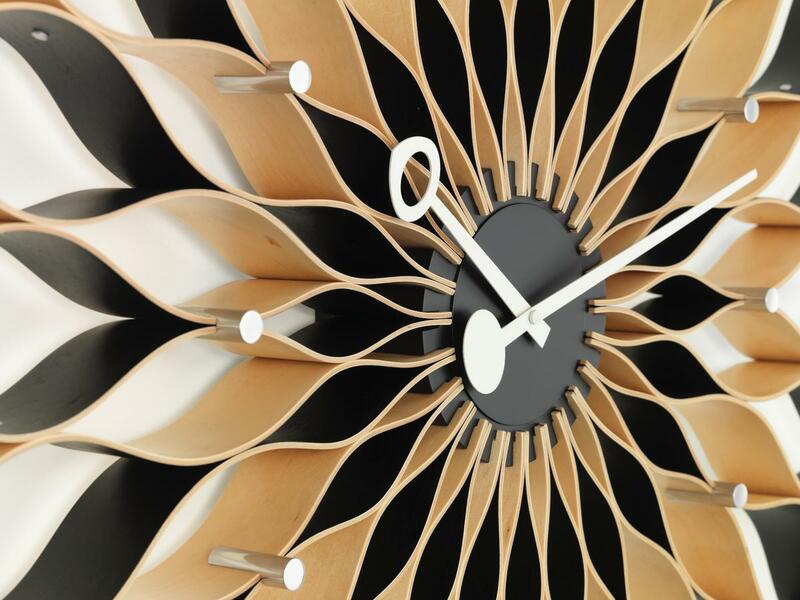 The Vitra Sunflower Clock is a re-edition of the classic from 1958. 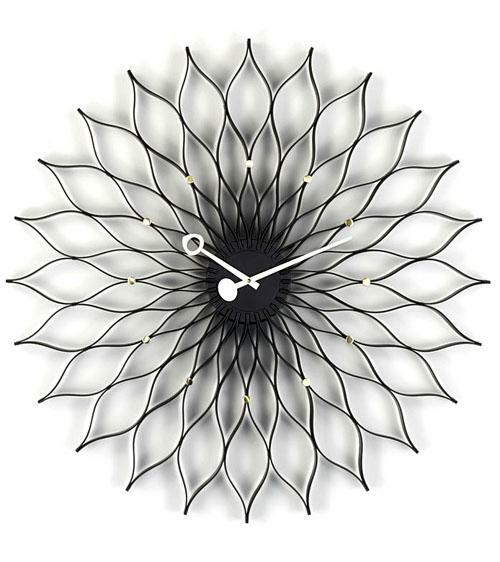 Originating in a series of wall clocks by George Nelson the Sunflower Clock combines a filigree birch structure with a high quality quartz movement. The unique shape of the sculptural structure is based on the Asteraceae family - sunflowers, daisies et al - and transforms a mundane object into a work of art. Care The wood surfaces should be cleaned with a soft, damp cloth and a mild, neutral detergent. Sophistication in layered birch: A true classic among the Vitra wall clocks the Sunflower Clock combines aesthetics and functionality, by turning time-telling a filigree wooden flower. 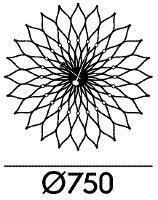 Designed by George Nelson in 1958 the Sunflower Clock belongs to the series of wall clocks created between 1948 and1960 for the Howard Miller Clock Company. Howard Miller, son of the furniture magnate Herman Miller, had learned the craft of clock-making in Germany's Black Forest, and in the Howard Miller Clock Company - a subsidiary of the Hermann Miller Furniture Company - had the opportunity to express his technical expertise. 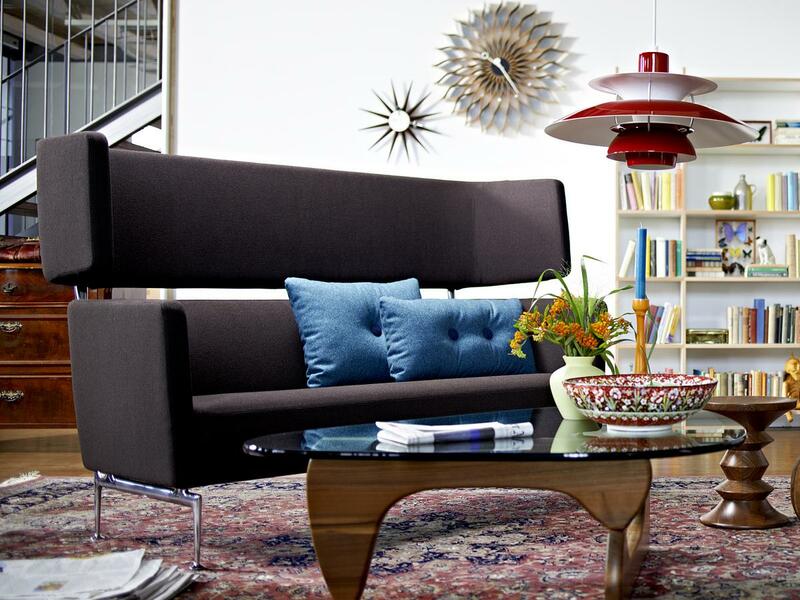 George Nelson, since 1945 Creative Director for Hermann Miller, delivered the innovative design. Since 1990 Vitra has produced the Nelson wall clocks an with the family of sculptural entities in a variety of shapes and materials , from stars, suns or flowers has a collection of clocks which stand as the perfect alternative to traditional wall clocks. The ornate objects are complimented by a high quality quartz movement. After studying architecture at Yale George Nelson won a scholarship to Rome through which he came into contact with classical European modernism, the buildings and for all their protagonists such as Mies van der Rohe, Le Corbusier and Walter Gropius. Experiences which were to have a large influence on the young architect. The modernist belief that design is a way to make the world better, influenced his subsequent work, be that for the magazine "Architectural Forum" or from 1945 as design director of the Herman Miller Furniture Company. One of the leading figures in the development of American design, he invited the likes of Charles & Ray Eames, Isamu Noguchi, Alexander Girard to work with Herman Miller and thus ensured the realization and dissemination of their designs. 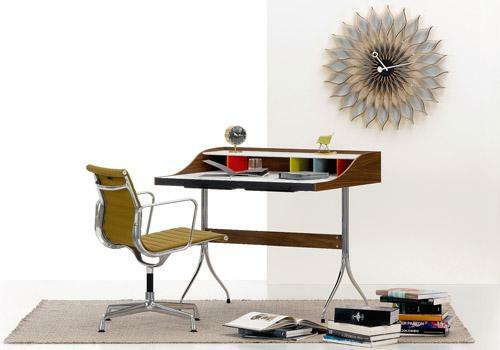 In addition, Nelson ran his own studio, creating designs such as the Vitra Sunflower Clock, which have become characteristic for the "Mid-Century-Modern". 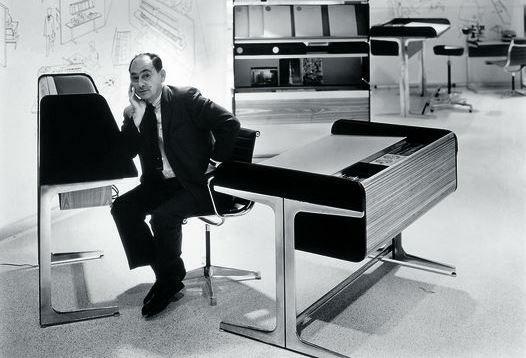 From 1957 onwards Nelson operated closely with the Swiss furniture manufacturer Vitra, and since his death in 1989 by the George Nelson Archive has been held by the Vitra Design Museum. 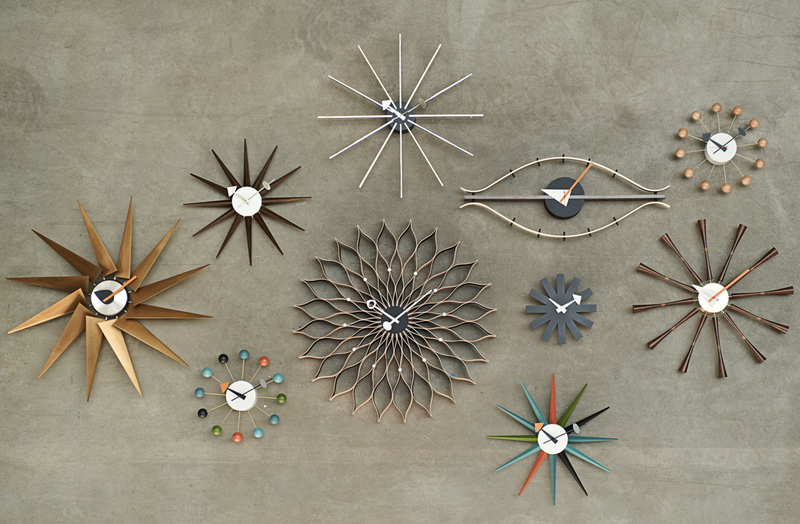 The designs of George Nelson, including the Nelson Sunflower Clock, are closely associated with Vitra. 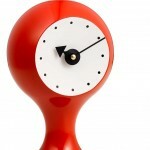 After the Herman Miller Furniture Company ceased production of the clocks in the 1980s 1980s, production was resumed in the 1990s by the Swiss furniture manufacturer Vitra, a firm who had long worked closely with George Nelson. The ideals Vitra and George Nelson are very much as one: Design is regarded as a way to make the world better, everyday objects are given a value that helps them unlock the value of everyday life itself. 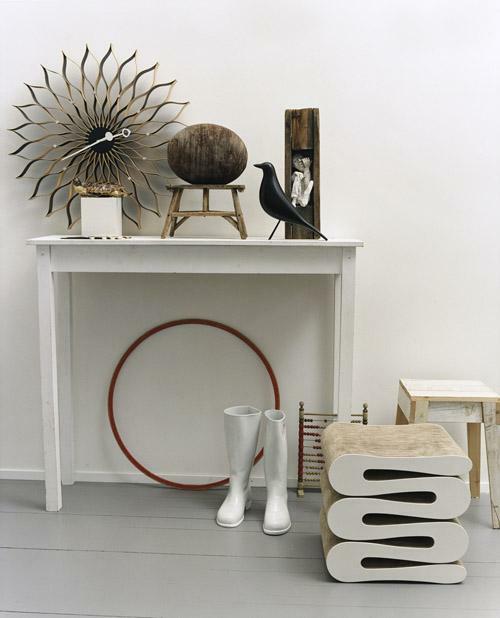 Vitra is in addition the European representative of the of the ideas of Ray & Charles Eames, Verner Panton, Alexander Girard and contemporary designers such Jasper Morrison, Maarten van Severen and Hella Jongerius. Aside from products, the Vitra Campus and the Vitra Design Museum make an important contribution to the understanding of innovation modern and contemporary design. 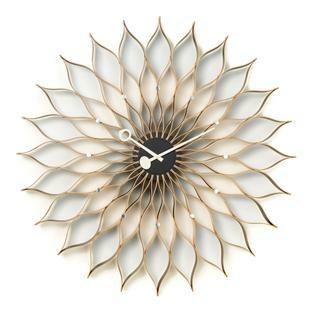 The perfect form of Vitra Sunflower Clock is achieved thanks to strips of layered and moulded birch which are formed into fine lines of an elaborate a flower and thus transform an essentially functional object into a floral wall decoration. Combined with metal pointers the result is a shape that is simple and innovative at the same time. 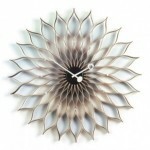 In principle very simple, the uniqueness of the George Nelson Sunflower clock arises from the idea behind its formation, as is the case with all designs in the Nelson clock family. 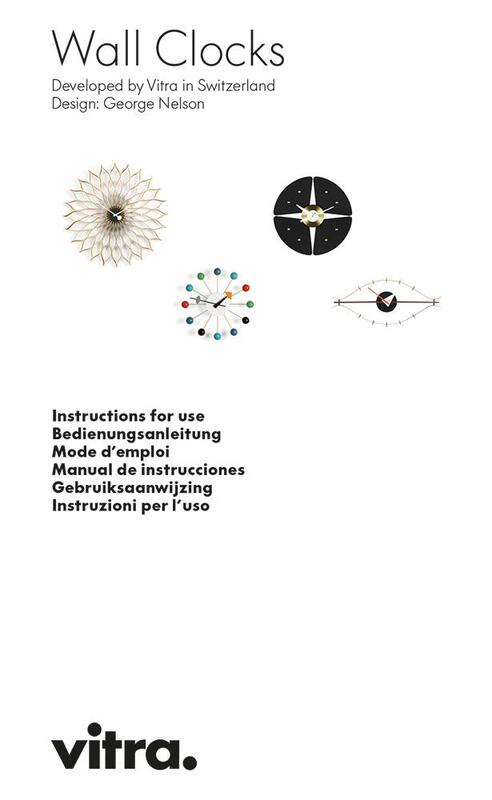 The Vitra Wall Clocks are manufactured by Vitra largely via manual processes using high-quality raw materials, thus objects such as the Sunflower Clock underscore the principle of sustainability practised by the Swiss manufacturer. The resultant Vitra Accessories and furniture are thus highly durable - both materially by their value as timeless classics. 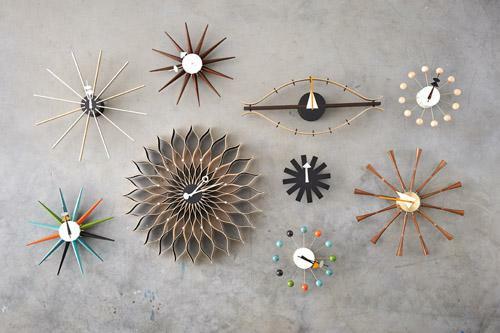 In addition to the Sunflower Clock George Nelson also designed many other objects which advanced American Mid-century modernism to design icons. Economic boom and the belief in the power of the future went hand in hand in 1950s America. As the consumer society developed the shape and appearance of everyday objects played an increasingly important role as a selling point. Modern design helped thus not only furniture but also other objects of everyday use find their place in American households. 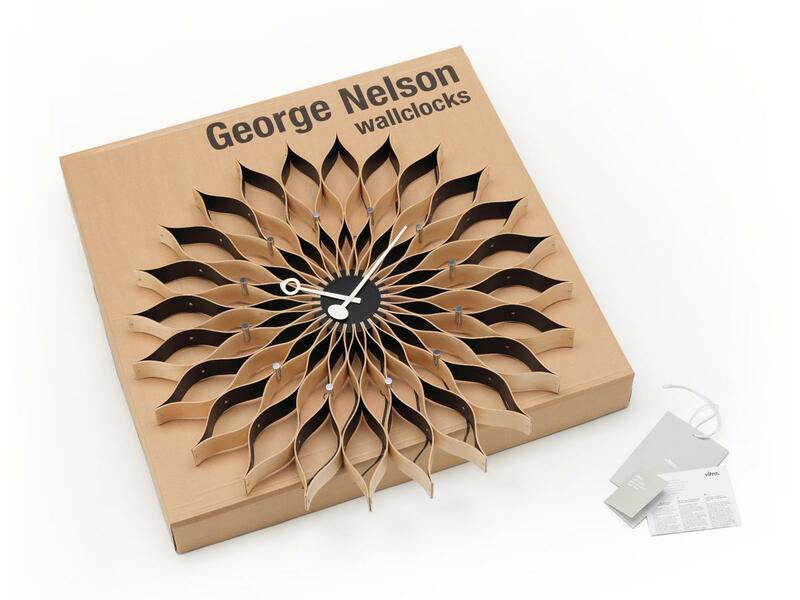 Against this background George Nelson designed collections of everyday objects such as lamps, clocks and other home accessories. The unmistakable formal language of organic modernism plays an important role, gives the objects an aura of optimism and dynamism, and ensured that even as times and society have evolved, objects such as the Sunflower Clock have remained icons of modern design. 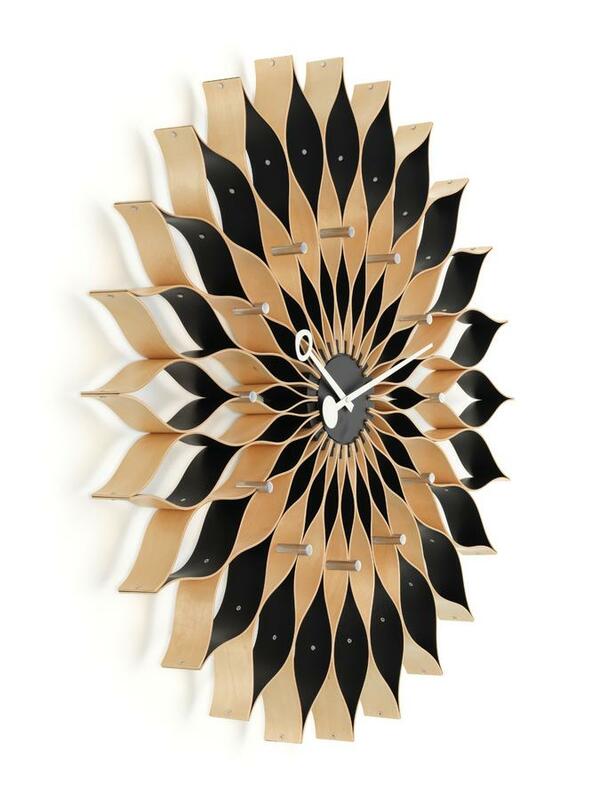 Produced by Vitra since the 1990s in 2013 the company launched as part as part of their Black Collection a variant of Nelson wall clock in black lacquered ash, the Sunflower Clock Black. 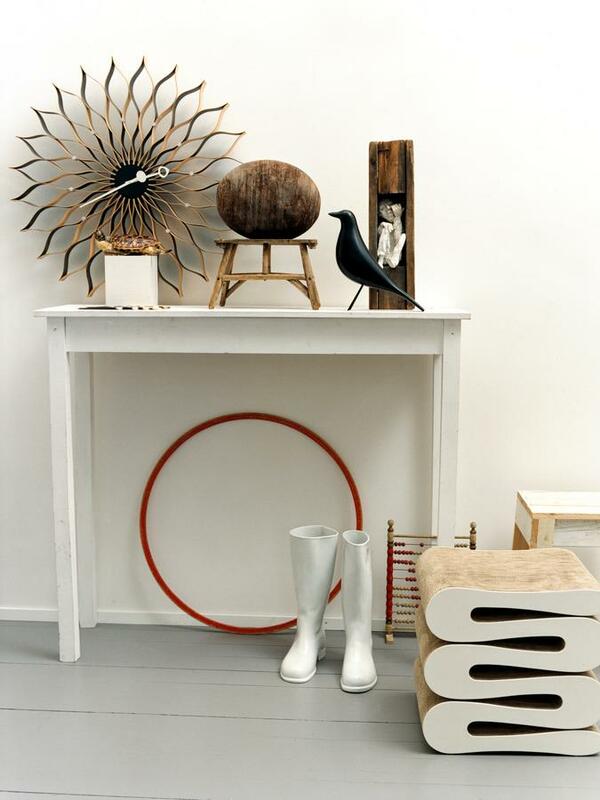 In addition to the Sunflower Clock Vitra produce other items by George Nelson including the Home Desk and Night Clock.